Vector fields are used in certain AI and simulation techniques. 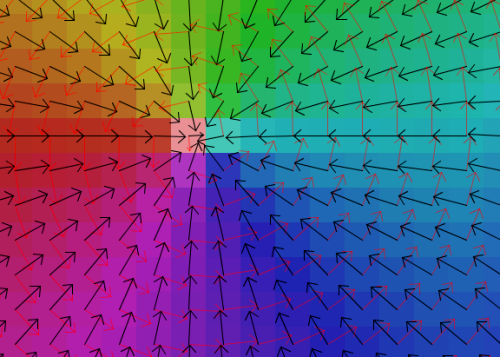 The tool below allows you to paint a vector field. These files can be saved in XML format, that can easily be loaded into another application. The Set Direction brush keeps the size of the underlying vector the same, but changes the size to a constant value. The Set Size brush keeps the size of the underlying vector the same, but changes the direction to a constant angle. The Attract brush draws all the vectors closer to the mouse cursor. The Repel brush pushes all vectors away from the mouse cursor. The Comb brush moves vectors in the same direction as the mouse. 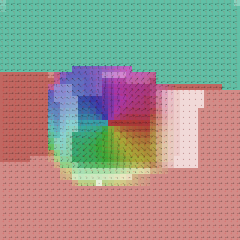 The XML file arranges the field into a quadtree. 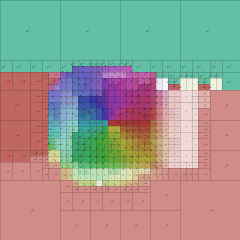 The quadtree compression can be viewed from the program. To change the brush size, use the ‘[‘ and ‘]’ keys. To change the brush options, use the ‘-‘ or ‘=’ keys. This is the first version of this program, so there are many missing features. For example, the size of the field can not be changed yet. If you find it useful, let me know in the comments!